Marcello de Cecco, an economic historian, is interviewed here on the international monetary system during Bretton Woods and after. Marcello de Cecco, an economic historian, is interviewed here on the international monetary system during the Great Depression. Marcello de Cecco, an economic historian, is interviewed here on the international monetary system, both during and after WWI. Engelbert Stockhammer gives a talk below which is an introduction to Post Keynesian economics, given on the 29 June at the Rethinking Economics Conference in London (28–29 June, 2014). I summarise below Lecture IV of Hayek’s Prices and Production (2nd edn. ; 1935), the classic work where Hayek developed his version of the Austrian business cycle theory (ABCT). I use the second, revised edition of 1935 (the first edition was published in 1931). In Lecture IV, Hayek considers the arguments for and against an elastic money supply. We must remember that Hayek’s main concern was to make money “neutral” with respect to the structure of production. “If the considerations brought forward in the last lecture are at all correct, it would appear that the reasons commonly advanced as a proof that the quantity of the circulating medium should vary as production increases or decreases are entirely unfounded. It would appear rather that the fall of prices proportionate to the increase in productivity, which necessarily follows when, the amount of money remaining the same, production increases, is not only entirely harmless, but is in fact the only means of avoiding misdirections of production.” (Hayek 1935: 105). “The second source of the prevalent belief that, in order to prevent dislocation, the quantity of the circulating medium must adapt itself to the changing needs of trade arises from a confusion between the demand for particular kinds of currency and the demand for money in general. This occurs especially in connection with the so-called seasonal variations of the demand for currency which in fact arises because, at certain times of the year, a larger proportion of the total quantity of the circulating medium is required in cash than at other times. The regularly recurring increase of the ‘demand for money’ at quarter days, for instance, which has played so great a role in discussions of central bank policy since attention was first drawn to it by the evidence of J. Horsley Palmer and J. W. Gilbart before the parliamentary committees of 1832 and 1841, is mainly a demand to exchange money held in the form of bank deposits into bank notes or coin. The same thing is true in regard to the ‘increased demand for money’ in the last stages of a boom and during a crisis. When, towards the end of a boom period, wages and retail prices rise, notes and coin will be used in proportionately greater amounts, and entrepreneurs will be compelled to draw a larger proportion of their bank deposits in cash than they used to do before. And when, in a serious crisis, confidence is shaken, and people resort to hoarding, this again only means that they will want to keep a part of their liquid resources in cash which they used to hold in bank money, etc. All this does not necessarily imply a change in the total quantity of the circulating medium, if only we make this concept comprehensive enough to comprise everything which serves as money, even if it does so only temporarily.” (Hayek 1935: 112–113). “(5) But at this point we must take account of a new difficulty which makes this concept of the total quantity of the circulating medium somewhat vague, and which makes the possibility of ever actually fixing its magnitude highly questionable. There can be no doubt that besides the regular types of the circulating medium, such as coin, bank notes and bank deposits, which are generally recognised to be money or currency, and the quantity of which is regulated by some central authority or can at least be imagined to be so regulated, there exist still other forms of media of exchange which occasionally or permanently do the service of money. Now while for certain practical purposes we are accustomed to distinguish these forms of media of exchange from money proper as being mere substitutes for money, it is clear that, ceteris paribus, any increase or decrease of these money substitutes will have exactly the same effects as an increase or decrease of the quantity of money proper, and should therefore, for the purposes of theoretical analysis, be counted as money. In particular, it is necessary to take account of certain forms of credit not connected with banks which help, as is commonly said, to economise money, or to do the work for which, if they did not exist, money in the narrower sense of the word would be required. The criterion by which we may distinguish these circulating credits from other forms of credit which do not act as substitutes for money is that they give to somebody the means of purchasing goods without at the same time diminishing the money spending power of somebody else. This is most obviously the case when the creditor receives a bill of exchange which he may pass on in payment for other goods. It applies also to a number of other forms of commercial credit, as, for example, when book credit is simultaneously introduced in a number of successive stages of production in the place of cash payments, and so on. The characteristic peculiarity of these forms of credit is that they spring up without being subject to any central control, but once they have come into existence their convertibility into other forms of money must be possible if a collapse of credit is to be avoided. But it is important not to overlook the fact that these forms of credits owe their existence largely to the expectation that it will be possible to exchange them at the banks against other forms of money when necessary, and that, accordingly, they might never come into existence if people did not expect that the banks would in the future extend credit against them. The existence of this kind of demand for more money, too, is therefore no proof that the quantity of the circulating medium must fluctuate with the variations in the volume of production. It is only a proof that once additional money has come into existence in some form or other, convertibility into other forms must be possible.” (Hayek 1935: 113–115). It is undoubtedly true that negotiable bills of exchange, negotiable promissory notes, negotiable cheques, and other private sector, monetised IOUs can expand the money supply, but Hayek never even considers that this might be sufficient to drive one of his Austrian business cycles – a serious flaw in his analysis. For the simple reason is that these forms of credit money need not be backed by prior “saving” and their expansion, if the “discount” on such bills falls below the “natural rate,” would increase the demand for factor inputs and perhaps even higher order capital investments. Some few instances where an increase in the money supply are warranted are discussed by Hayek too (Hayek 1935: 120–124). If one firm splits into two firms and the need for money to purchase factor inputs thereby increases, then an increase in money supply may be warranted (Hayek 1935: 120–121). Also, if there is a change in velocity of circulation, then the amount of money in circulation may need to be changed (Hayek 1935: 123–124). “(10) Even now our difficulties are not at an end. For, in order to eliminate all monetary influences on the formation of prices and the structure of production, it would not be sufficient merely quantitatively to adapt the supply of money to these changes in demand, it would be necessary also to see that it came into the hands of those who actually require it, i.e., to that part of the system where that change in business organisation or the habits of payment had taken place. It is conceivable that this could be managed in the case of an increase of demand. It is clear that it would be still more difficult in the case of a reduction. But quite apart from this particular difficulty which, from the point of view of pure theory, may not prove insuperable, it should be clear that only to satisfy the legitimate demand for money in this sense, and otherwise to leave the amount of the circulation unchanged, can never be a practical maxim of currency policy. No doubt the statement as it stands only provides another, and probably clearer, formulation of the old distinction between the demand for additional money as money which is justifiable, and the demand for additional money as capital which is not justifiable. But the difficulty of translating it into the language of practice still remains. The ‘natural’ or equilibrium rate of interest which would exclude all demands for capital which exceed the real supply capital, is incapable of ascertainment, and, even if it were not, it would not be possible, in times of optimism, to prevent the growth of circulatory credit outside the banks. Hence the only practical maxim for monetary policy to be derived from our considerations is probably the negative one that the simple fact of an increase of production and trade forms no justification for an expansion of credit, and that—save in an acute crisis—bankers need not be afraid to harm production by overcaution. Under existing conditions, to go beyond this is out of the question. In any case, it could be attempted only by a central monetary authority for the whole world: action on the part of a single country would be doomed to disaster. It is probably an illusion to suppose that we shall ever be able entirely to eliminate industrial fluctuations by means of monetary policy. The most we may hope for is that the growing information of the public may make it easier for central banks both to follow a cautious policy during the upward swing of the cycle, and so to mitigate the following depression, and to resist the well-meaning but dangerous proposals to fight depression by ‘a little inflation.’” (Hayek 1935: 124–125). In other words, even the few exceptions where changes in the money supply are theoretically warranted are practically difficult or impossible to actually address by central banks. “Though I believe that recurring business depressions can only be explained by the operation of our monetary institutions, I do not believe that it is possible to explain in this way every stagnation of business. This applies in particular to the kind of prolonged depression through which some European countries are passing today. It would be easy to demonstrate by the same type of analysis which I have used in the last two lectures that certain kinds of State action, by causing a shift in demand from producers’ goods to consumers' goods, may cause a continued shrinking of the capitalist structure of production, and therefore prolonged stagnation. This may be true of increased public expenditure in general or of particular forms of taxation or particular forms of public expenditure. In such cases, of course, no tampering with the monetary system can help. Only a radical revision of public policy can provide the remedy.” (Hayek 1935: 128). I summarise below Lecture II of Hayek’s Prices and Production (2nd edn. ; 1935), the classic work where Hayek developed his version of the Austrian business cycle theory (ABCT). I use the second, revised edition of 1935 (the first edition was published in 1931). “…it is my conviction that if we want to explain economic phenomena at all, we have no means available but to build on the foundations given by the concept of a tendency towards an equilibrium. For it is this concept alone which permits us to explain fundamental phenomena like the determination of prices or incomes, an understanding of which is essential to any explanation of fluctuation of production. If we are to proceed systematically, therefore, we must start with a situation which is already sufficiently explained by the general body of economic theory. And the only situation which satisfies this criterion is the situation in which all available resources are employed. The existence of unused resources must be one of the main objects of our explanation. (4) To start from the assumption of equilibrium has a further advantage. For in this way we are compelled to pay more attention to causes of changes in the industrial output whose importance might otherwise be underestimated. I refer to changes in the methods of using the existing resources. Changes in the direction given to the existing productive forces are not only the main cause of fluctuations of the output of individual industries; the output of industry as a whole may also be increased or decreased to an enormous extent by changes in the use made of existing resources. Here we have the third of the contemporary explanations of fluctuations which I referred to at the beginning of the lecture. What I have here in mind are not changes in the methods of production made possible by the progress of technical knowledge, but the increase of output made possible by a transition to more capitalistic methods of production, or, what is the same thing, by organising production so that, at any given, moment, the available resources are employed for the satisfaction of the needs of a future more distant than before. It is to this effect of a transition to more or less ‘roundabout’ methods of production that I wish particularly to direct your attention. For, in my opinion, it is only by an analysis of this phenomenon that in the end we can show how a situation can be created in which it is temporarily impossible to employ all available resources.” (Hayek 1935: 34–36). Hayek is also concerned with the structure of production: that is, changes which involve a longer as opposed to a shorter period of production and a hence a longer period of time before final consumer goods output is produced (Hayek 1935: 38). 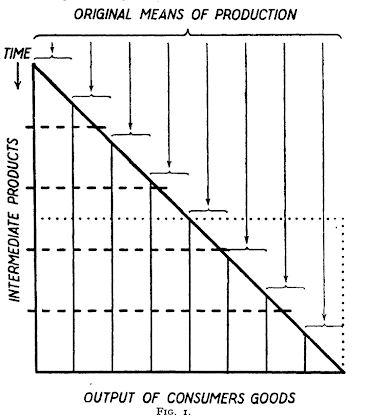 Hayek has the following famous diagram illustrating the structure of production, as below. … “I find it convenient to represent the successive applications of the original means of production which are needed to bring forth the output of consumers’ goods accruing at any moment of time, by the hypotenuse of a right-angled triangle, such as the triangle in Fig. I. The value of these original means of production is expressed by the horizontal projection of the hypotenuse, while the vertical dimension, measured in arbitrary periods from the top to the bottom, expresses the progress of time, so that the inclination of the line representing the amount of original means of production used means that these original means of production are expended continuously during the whole process of production. The bottom of the triangle represents the value of the current output of consumers’ goods. The area of the triangle thus shows the totality of the successive stages through which the several units of original means of production pass before they become ripe for consumption. It also shows the total amount of intermediate products which must exist at any moment of time in order to secure a continuous output of consumers’ goods. 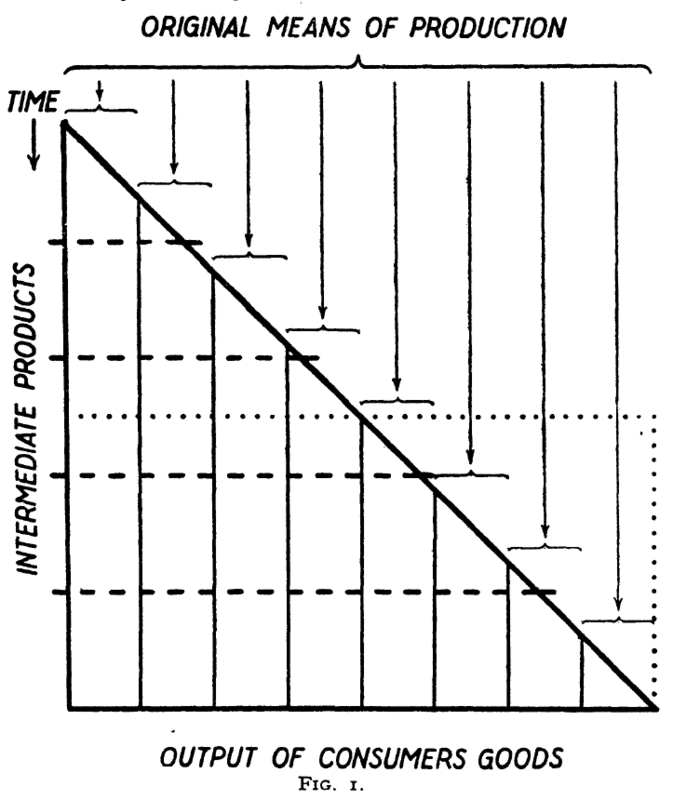 For this reason we may conceive of this diagram not only as representing the successive stages of the production of the output of any given moment of time, but also as representing the processes of production going on simultaneously in a stationary society.” (Hayek 1935: 38–40). As time increases between the use of the original means of production and the actual production of final consumer goods output, production becomes “more capitalistic” (Hayek 1935: 42). The crucial problem for Hayek is: how does an economy transition from lower to much higher “capitalistic” methods of production? (Hayek 1935: 49). “… a transition to more (or less) capitalistic methods of production will take place if the total demand for producers’ goods (expressed in money) increases (or decreases) relatively to the demand for consumers’ goods. This may come about in one of two ways: either as a result of changes in the volume of voluntary saving (or its opposite), or as a result of a change in the quantity of money which alters the funds at the disposal of the entrepreneurs for the purchase of producers’ goods.” (Hayek 1935: 50). (3) a situation of general equilibrium in which no unused resources are available. Both Blaug (1992: 126) and King (2013: 123) point out that a market rate of interest and some kind of “natural” rate of interest can be found in David Ricardo’s On the Principles of Political Economy and Taxation. “The rate of interest, though ultimately and permanently governed by the rate of profit, is however subject to temporary variations from other causes. With every fluctuation in the quantity and value of money, the prices of commodities naturally vary. They vary also, as we have already shewn, from the alteration in the proportion of supply to demand, although there should not be either greater facility or difficulty of production. When the market prices of goods fall from an abundant supply, from a diminished demand, or from a rise in the value of money, a manufacturer naturally accumulates an unusual quantity of finished goods, being unwilling to sell them at very depressed prices. To meet his ordinary payments, for which he used to depend on the sale of his goods, he now endeavours to borrow on credit, and is often obliged to give an increased rate of interest. This, however, is but of temporary duration; for either the manufacturer's expectations were well grounded, and the market price of his commodities rises, or he discovers that there is a permanently diminished demand, and he no longer resists the course of affairs: prices fall, and money and interest regain their real value. If by the discovery of a new mine, by the abuses of banking, or by any other cause, the quantity of money be greatly increased, its ultimate effect is to raise the prices of commodities in proportion to the increased quantity of money; but there is probably always an interval, during which some effect is produced on the rate of interest.” (Ricardo 1821: 349–350). “M. Say allows, that the rate of interest depends on the rate of profits; but it does not therefore follow, that the rate of profits depends on the rate of interest. One is the cause, the other the effect, and it is impossible for any circumstances to make them change places.” (Ricardo 1821: 353, n.). “It is contended, that the rate of interest, and not the price of gold or silver bullion, is the criterion by which, we may always judge of the abundance of paper-money; that if it were too abundant, interest would fall, and if not sufficiently so, interest would rise. It can, I think, be made manifest, that the rate of interest is not regulated by the abundance or scarcity of money, but by the abundance or scarcity of that part of capital, not consisting of money.” (Ricardo 1810: 43). So Ricardo though that the money rate of interest was determined by a real factor: the rate of profit on capital (King 2013: 123). “I do not dispute, that if the Bank were to bring a large additional sum of notes into the market, and offer them on loan, but that they would for a time affect the rate of interest. The same effects would follow from the discovery of a hidden treasure of gold or silver coin. If the amount were large, the Bank, or the owner of the treasure, might not be able to lend the notes or the money at four, nor perhaps, above three per cent. ; but having done so, neither the notes, nor the money, would be retained unemployed by the borrowers; they would be sent into every market, and would every where raise the prices of commodities, till they were absorbed in the general circulation. It is only during the interval of the issues of the Bank, and their effect on prices, that we should be sensible of an abundance of money; interest would, during that interval, be under its natural level; but as soon as the additional sum of notes or of money became absorbed in the general circulation, the rate of interest would be as high, and new loans would be demanded with as much eagerness as before the additional issues.” (Ricardo 1810: 46–47). (2) a letter to Thomas Malthus on the 21 October, 1817. King, John Edward. 2013. David Ricardo. Palgrave Macmillan, Basingstoke, UK. Smithin, John N. 2003. Controversies in Monetary Economics (rev. edn.). Edward Elgar, Cheltenham, UK and Northhampton, MA. “It only remains to enquire, lastly, whether any principle of moderation and forbearance on the part of the borrowers at the bank may be likely to exempt the directors of that institution from the necessity of imposing their own limit. It may possibly be thought, that a liberal extension of loans would soon satisfy all demands, and that the true point at which the encrease of the paper of the bank ought to stop, would be discovered by the unwillingness of the merchants to continue borrowing. In order to ascertain how far the desire of obtaining loans at the bank may be expected at any time to be carried, we must enquire into the subject of the quantum of profit likely to be derived from borrowing there under the existing circumstances. This is to be judged of by considering two points: the amount, first, of interest to be paid on the sum borrowed; and, secondly, of the mercantile or other gain to be obtained by the employment of the borrowed capital. The gain which can be acquired by the means of commerce is commonly the highest which can be had; and it also regulates, in a great measure, the rate in all other cases. We may, therefore, consider this question as turning principally on a comparison of the rate of interest taken at the bank with the current rate of mercantile profit. The bank is prohibited, by the state of the law, from demanding, even in time of war, an interest of more than five per cent., which is the same rate at which it discounts in a period of profound peace. It might, undoubtedly, at all seasons, sufficiently limit its paper by means of the price at which it lends, if the legislature did not interpose an obstacle to the constant adoption of this principle of restriction.” (Thornton 1802: 286–287). Humphrey, Thomas M. 1993. Money, Banking, and Inflation: Essays in the History of Monetary Thought. Edward Elgar, Aldershot, UK and Brookfield, VT.
Laidler, David. 1989. “The Bullionist Controversy,” in J. Eatwell. M. Milgate. and P. Newman (eds), The New Palgrave. Money. Macmillan, London. 60–71. “Early 19th century origins of the Natural Rate of Interest,” Economicreflections, 15 October, 2014. “The circulation of each district must bear a certain proportion with that of the rest of the kingdom, in order that its internal trade may balance, and if the general circulation be ever so deficient, the Banks of no district can increase their issues, unless the others do so; nor yet, in the regular course of banking reduce them, be it ever so redundant, unless the reduction be general. If the prices of any district were either above or below their due proportion with the rest, an exportation or importation of corn and cattle, as we explained in our last letter, would bring them in, probably, a few weeks to their level. Any internal cause, therefore, by which a general extension or contraction of the currency is produced must be common to all. We also pointed out, in our former letters, that money had two values,—its value as currency, and its value as income, or capital; and that the issues of our banks are founded upon a demand for the latter, governed evidently by principles that ought to have no connexion whatever with the currency. There was no want of currency when the banks first issued notes; but by forcing the original metallic money out of circulation, they have created a want, and this want, is a sum of paper, precisely equal to the amount of metallic money, which would have been in circulation if there had not been any paper money at all. The interest demand for money, or capital is also subject to great fluctuations. During war, when Government borrows largely, it is infinitely greater than during peace, when it does not borrow any. In the former period, the natural market-rate of interest has often been seven or eight per cent, and is generally above five; in the latter it has often been at two per cent, and is generally under four. The natural rate of interest, however, can never be properly known with our system of currency. It depends, as we have stated, upon the quantity of income saved, proportioned to the demand for capital. But, with the power possessed by our banks of cancelling money which has been saved, or manufacturing it when it has not, this supply and demand can never be ascertained. Consequently, the banks have an arbitrary charge, some of four, but most of five per cent., from which they do not vary; but which, being neither the natural war-rate nor the peace-rate, is as little likely to be the true rate as any other between these two extremes they could have pitched upon. The natural rate of interest is pretty uniform throughout the kingdom; and when money is scarce or plentiful it operates upon all the banks at the same time. When, therefore, during the war, it was above five per cent, there was a constant tendency in the banks to increase their issues; since the war, except for a short interval, it has been considerably under that rate, and a great reduction of their issues has taken place.” (Letter IX. To the Editor of the Courier, in Joplin 1825: 37–38). This appears to be a monetary “natural rate” that clears the market for loanable funds, when the money supply is limited strictly to a given supply of commodity money (for Joplin’s other works, see Joplin 1823 and 1832). According to Glasner (1997: 56), Thomas Joplin had the clearest expression of the idea of a “natural rate” before Wicksell, although Henry Thornton (1760–1815) was also another early theorist with a proto-natural rate concept. I am not quite sure what relationship Joplin had to the Currency School, but their ideas seem similar, and Hayek even considered Joplin the “inventor of the currency [sc. school] doctrine” (Hayek 1935: 15). The Currency School’s ideas were seen by the early Austrians like Mises and Hayek as the precursor to their Austrian business cycle theory (Mises 2006 : 101–103; Garrison 1997: 23). Another point that strikes me (as brought out in the Economicreflections blog post) is that there was a great deal of intense discussion of economic issues in the early 19th century, but now largely forgotten. (2) the debates after 1819 between the Banking School, the Currency School, and Free Banking School over what caused the business cycle and other monetary issues (White 1997). (3) the emerging anti-laissez faire, protectionist writings of Friedrich List (1789–1846), Henry Clay (1777–1852), and the early German Historical School. Checkland, S. G. 1948. “The Birmingham Economists, 1815–1850,” The Economic History Review n.s. 1.1: 1–19. Glasner. D. 1997. “Bullionist Controversies,” in D. Glasner and T. F. Cooley (eds). Business Cycles and Depressions: An Encyclopedia. Garland Pub., New York. 56–58. Joplin, T. 1825. An Illustration of Mr. Joplin’s Views on Currency, and Plan for Its Improvement; together with Observations applicable to the Present State of the Money; in a series of Letters. Baldwin, Cradock, and Joy, London. O’Brien, D. P. 1997. “Joplin, Thomas (c. 1790–1847),” in D. Glasner and T. F. Cooley (eds). Business Cycles and Depressions: An Encyclopedia. Garland Pub., New York. 344–345. Viner, Jacob. 1955. Studies in the Theory of International Trade. Allen & Unwin, London. White, Lawrence H. 1997. “Banking School, Currency School, and Free Banking School,” in D. Glasner and T. F. Cooley (eds). Business Cycles and Depressions: An Encyclopedia. Garland Pub., New York. 47–49. On 16th January, 1888, Alfred Marshall appeared before the British “Royal Commission on the Value of Gold and Silver” (instituted in 1887), and was questioned about the economic conditions of the 1870s and 1880s in Britain during the first part of the great deflation of 1873 to 1896. “[Question:] 9823. Do you share the general opinion that during the last few years we have been passing through a period of severe depression? [Marshall:] Yes, of severe depression of profits. [Question:] 9824. And that has been during a period of abnormally low prices? [Marshall:] A severe depression of profits and of prices. I have read nearly all the evidence that was given before the Depression of Trade and Industry Commission, and I really could not see that there was any very serious attempt to prove anything else than a depression of prices, a depression of interest, and a depression of profits; there is that undoubtedly. I cannot see any reason for believing that there is any considerable depression in any other respect. There is of course great misery among the poor; but I do not believe it is greater than it used to be. I do not mean that we should idly acquiesce in the existence of this misery, and regard it as inevitable. I hold rather extreme opinions in the opposite direction. [Question:] 9825. (Chairman.) Then I understand you to think that the depression in those three respects is consistent with a condition of prosperity? [Question:] 9826. (Mr. Chaplin.) The depression of profits, does not that more or less affect all classes? [Marshall:] No, I believe that a chief cause of the depression of profits is that the employer gets less and the employé more. [Question:] 9827. You think that during a period of depression the employed working classes have been getting more than they did before? [Marshall:] More than they did before, on the average. I do not deny that during the years of spasmodic inflation everybody was working very hard; everybody got exceptionally high returns, employers and employed together. But, as I have already said, I think that history shows that those times have always sown the seeds of coming disasters. [Question:] 9828. Can you speak as to the fact whether there has been a larger number of the working classes than usual unemployed altogether during this period of depression? [Marshall:] My belief is that there have not been a larger number of people unemployed during the last 10 years than during any other consecutive 10 years. Of course there are many more unemployed now than there were in 1872–73. [Question:] 9829. Do you speak with knowledge of the thing and of the working classes? [Marshall:] I speak from personal observation ranging over many years, and a study of almost everything of importance that has been written on the subject. [Question:] 9830. Are you aware that we have had evidence given by gentlemen speaking with definite knowledge of a directly opposite nature to what you are stating now? [Marshall:] I am aware that some persons actively engaged in business have given evidence that they believe there is an increasing unsteadiness of employment. But the facts which they bring forward are, in my opinion, outweighed by the statistical and other evidence in the opposite direction. I have given reasons for believing that the statistics showing unsteadiness of employment require to be carefully interpreted; because the more people are employed in factories the more every interruption of employment shows itself in statistics. I have, however, omitted one thing of very great importance. I think that whatever had been the condition of prices there would have been a special reason causing irregularity of employment now; that is the transitional stage in which a great number of industries are. When an improvement is brought into an industry it benefits the public at once, and in the long run it is pretty sure to benefit even the trade into which it is introduced; but in many cases an improvement in the methods of the industry injures that industry, and throws people temporarily out of employment. Now, I do not think there has been any period in which there have been so many great changes. That has been put before you by Mr. Fowler, and it has been argued at great length in Mr. Wells’ articles that this has been a period of great changes in the methods of industry, changes of such a kind as to tend to throw people out of employment. But in spite of that, I do not believe that the want of employment is, on the average, greater than it has been. [Question:] 9831. But you mean to say that these changes, as you have described them on the methods of industry, have not been continuing now for a great number of years? An interesting research question is: if real wages were rising in this period, was this because of sticky nominal wages in the face of price deflation, which in turn would have squeezed profits? Or was there some other reason? On unemployment, Marshall did not think that during the 10 year period from 1878–1888 high unemployment was higher as compared with other periods. What is fascinating is that the period of high unemployment from 1884–1887 comes at just the right time when the Royal Commission on the Value of Gold and Silver was set up. But caused the high unemployment? That there was insufficient private investment seems a reasonable answer. But why insufficient private investment? If profits were depressed and this caused business expectations to become pessimistic, then the underlying cause was deflation. Moreover, it is likely that debt deflationary dynamics were at work, though hardly as severe as that which hit the Western world from 1929 to 1933. This seems to be the reasonable explanation for the unusual data for this period. “In the 1920s and early 1930s, for example, as judged by the standards of the time, Hayek showed no aversion to mathematics. More substantively important, he was an exponent of and contributor to Walrasian general-equilibrium analysis, which he referred to as ‘the modern theory of the general interdependence of all economic quantities, which has been most perfectly expressed by the Lausanne School of theoretical economics’ (1929, tr. 1933, footnote on p. 42). The idea of competitive markets as being in a constant state of evolving disequilibrium as they process and disseminate information and incentives among agents, which we nowadays associate so strongly with Hayek, did not become central to his thought until after the appearance of his 1937 paper ‘Economics and Knowledge.’” (Laidler 1999: 31). That is a very important point: the early Hayek was just as much a Walrasian general-equilibrium theorist as an Austrian, even though he did of course draw on Austrian capital theory and Mises’ trade cycle theory, and developed this uniquely “Austrian” theory which itself drew on Wicksell’s monetary equilibrium tradition. I discuss the problems with Hayek’s trade cycle theory which stem from its use of Walrasian general-equilibrium here. Foremost amongst these problems is the role of expectations, a criticism which Myrdal (1933) made against Hayek a few years after Prices and Production (1931) was published. Myrdal, G. 1933. “Der Gleichgewichtsbegriff als Instrument der geld-theoretischen Analyse,” in F. A. Hayek (ed. ), Beiträge zur Geldtheorie. Springer, Vienna. 361–487.